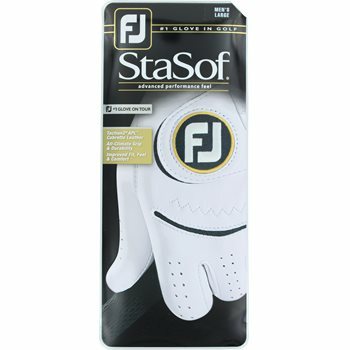 This FootJoy StaSof glove offers the ultimate feel in tour-proven performance. Excellence in innovation has made the StaSof glove preferred by the world’s best players for over 30 years. Taction2 Advanced Performance leather provides optimum feel, exceptional moisture management and improved grip performance for all-climate conditions. A more tailored precision fit across the palm, knuckles and cuff, improves StaSof glove’s overall fit and comfort. The angled ComforTab closure and PowerNet mesh insert adds an extra measure of comfort, fit and breathability.